Comprehensive Introduction to RCM. One-third the cost of live training. Until now, RCM training has only been available through expensive consultants requiring travel for the consultant or for you (not to mention the time away from home and work!). Access training on your PC, laptop, tablet, or Smartphone. Here’s what RCM implementers are saying about the RCM process. "RCM elevates weaknesses, errors, and deficiencies so solutions can be formulated." "I think we should have done RCM a long time ago. We would have ended up with a lot of fewer headaches." "It’s a direct interface between us and the manufacturer." Get Instant Access To The Course! This module is an overview of the RCM process. We’ll set forth the definition of RCM and review key terms. We’ll lay out the over-arching topics that will be covered in the course. We’ll finish up by discussing when in asset’s lifecycle RCM should be applied. Before we start exploring the principles of RCM, it’s essential to know not only how – but why – RCM was conceived in the first place. That way we can really appreciate the majesty of its principles. This module takes us back to the commercial airline industry in the mid 1950s. It’s a gripping story – and one that anyone who is responsible for physical asset management should know and understand. We’ll cover the events that transformed their philosophy regarding equipment failure. And we’ll tell the story of how RCM was born and detail the various RCM processes and documents that exist today. This Module plays an important role in the formulation of your own Asset Management Philosophy. In this module we’ll review the top three methods used to carry out RCM and we’ll evaluate whether or not each contains two of the main ingredients for a successful RCM analysis. Through the review of one of the most devastating, yet remarkable, aircraft crashes in U.S. history, we’ll highlight how teamwork is essential to preparation. We’ll also examine the pros and cons of historical data, in what ways it can be used in an RCM analysis, and how a Facilitated Working Group approach can successfully fill the gaps. We’ll set forth the benefits of a Facilitated Working Group, describe the logistics of a team approach, and identify what makes Working Groups Effective including characteristics of a capable Facilitator. In this module we’ll introduce the Operating Context, the document that is prepared prior to carrying out the seven steps of the RCM Analysis. We’ll talk about why an Operating Context is prepared and we’ll outline the elements that are included in an Operating Context. In this module, we’ll review the importance of writing Functions and why it’s the first step in the RCM process. Through the review of three air tanker crashes, we’ll discuss the idea of performance and why it is absolutely critical that the difference between Required Performance and Design Capability is differentiated. We’ll set forth the two types of Functions – Primary and Secondary – and how to classify them as either Evident or Hidden. We’ll learn how to compose Functions and how to document them on the RCM Information Worksheet. Functional Failures is the easiest step in the RCM Process and, relatively speaking, it’s pretty straight-forward. In this module, we’ll review what a Functional Failure is and identify the two types of Functional Failures – Total and partial. We’ll also identify how to compose Functional Failures and how to document them on the RCM Information Worksheet. In this module, we’ll talk about how a properly written Failure Mode puts you on the right road and sends you in the right direction towards formulating technically appropriate Failure Management Strategies. A Failure Mode is what specifically causes a Functional Failure. But all Failure Modes have to contain the right amount of detail and be written at the right level in order to formulate meaningful solutions. We’ll set forth the four questions to ask in order to determine if a Failure Mode should be included in an RCM Analysis. That way we avoid “analysis paralysis.” We’ll also show you how to document Failure Modes on the RCM Information Worksheet. A Failure Effect is written for each Failure Mode. In this module, we’ll explore what a Failure Effect is, how to write one, what information to include (and how detailed it should be), and how to record it on the RCM Information Worksheet. The “essence of RCM,” as my mentor, the late John Moubray used to say, is “managing the consequences of failure.” In this module, we’ll start with an introduction to the RCM Decision Diagram and then learn how to classify Failure Modes as Evident or Hidden. Then we’ll discover how to assess the Consequences of each Failure Mode as Safety, Environmental, Operational, or Non-Operational. We’ll finish up the module by talking about how to record Consequences on the RCM Decision Worksheet. Assigning proactive maintenance and associated intervals is the sixth step in the RCM process. In this module, we’ll discuss what constitutes “proactive maintenance,” in the context of RCM. We’ll also set forth the two criteria that must be satisfied in order to assign a proactive maintenance task. We’ll discuss Scheduled Restoration, Scheduled Replacement, and On-Condition maintenance tasks in-depth. And we’ll learn how to document these proactive tasks on the RCM Decision Worksheet. Assigning Default Strategies is the seventh step in the RCM process. In this module, we’ll discuss Default Checks; Failure Finding Tasks; No Scheduled Maintenance; and other Default Strategies such as engineering redesigns, operating procedure additions, supply changes, technical publication revisions, and training recommendations. And we’ll learn how to document these proactive tasks on the RCM Decision Worksheet. Upon completion of an RCM analysis, it must be validated. In this module, we’ll discuss the Validation and Implementation process. Here’s what people who completed The Foundations of RCM are saying about it. Reliability Centered Maintenance: This isn’t just a “maintenance” improvement process – it is a STRATEGIC weapon. It addresses the whole issue of how we “fly and fight” and eliminates problems of operating and maintaining weapons systems. This online course is a great introduction to the RCM process. I'm helping companies in almost every industry (food, petrochemical, oil & gas, pharmaceutical, nuclear, etc.) to reach excellence level concerning project management, maintenance, and reliability. RCM is one of the 28 building blocks of my BAM-model (Brilliant Asset Management model) and I will certainly use this online course in my training sessions because it explains RCM in such a simple way anyone could understand. 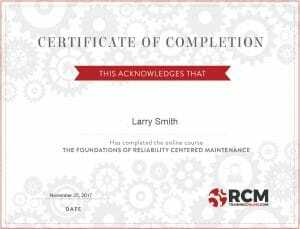 Even with 24 years of US Army Maintenance and Safety Management training and experience, I found The Foundations of Reliability Centered Maintenance online course to be hugely informative. I highly recommend it to middle and upper management of any organization. Since they’re the ones making daily, tactical decisions and long-term strategic plans for the organization’s maintenance and operations programs, they need to understand how RCM analysis combines cost-effectiveness with safety which leads to the increased efficiency and profitability of any organization. My mentor, Rudi Frederix, talked me about RCM and introduced me to this online course. The timing for me couldn’t have been better because I had just started my new job as reliability engineer and I needed to learn a lot about asset management. RCM was all new to me, but I enjoyed the course from the start! The whole RCM process is very clear to me now. The units were built up in a very logical manner and the videos were not too long. That helped me stay focused the whole time. Now I go back to this course very often, almost daily, to use it for my work. So thank you very much for making this website/course. These modules are designed to give you a comprehensive introduction to the principles of RCM. Each module is broken into easy-to-digest units making it simple to learn the basics of RCM. You will be able to keep track of your progress so that you can complete the course at your own pace. Each unit contains an easy-to-follow video. Most video lessons are no longer than 10 minutes so you can complete each unit easily. We provide high quality printable resources including worksheets, our quick reference guide, our decision diagram, and course notes. Complete all the units in a module and then test your knowledge on the material before you move on. When you successfully complete all of the modules and their quizzes, you will get access to a personalized, printable Certificate of Completion. A hardcover copy of Nancy’s book will be mailed directly to you! Put RCM principles to use in our case study starting with the Operating Context and apply all seven steps of RCM. Are you interested in training a team? We offer a group discount. Click here if you want more information about setting up access for your whole team. Q: What exactly do I get with The Foundations of RCM? Q: Who is this training for? A. The Foundations of RCM is hugely beneficial to anyone who has anything to do with asset management – from artisans to executives. Q: Do I need any prerequisite knowledge before I learn about RCM? A. Absolutely not. It helps if you have a love – or even a fondness – for equipment maintenance and reliability. But other than that, just put your thinking cap on and you’re good-to-go. Q: Can I download the course syllabus so I can check it out? A. Sure. You can download it here. Q: Will I have the opportunity to discuss the course information and ask questions? A. Absolutely. 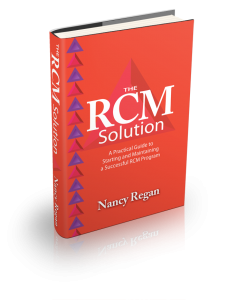 Anyone who registers for The Foundations of RCM gets access to online monthly live group coaching workshops calls hosted by Nancy Regan. You can ask questions and bring up topics about all-things Reliability Centered Maintenance. Can’t make it for the workshop? Don’t worry. You won’t miss out. Email your questions ahead of time and Nancy Regan will answer them during the workshop. Workshops are recorded so they’re available to you anywhere, anytime. Only an internet connection is required! Q: How will I access the training? A. The training will be accessed completely online through your own personal portal. Q: When can I access the training? A. The training can be accessed 365 days per year, 7 days per week, 24 hours per day. Q: How long do I have access to the training course? A. You have lifetime access to the training course. Take advantage of our special offer to get access to our exclusive members-only bonuses for the first year for free. You will continue to have access to member perks as long as you are a paying member. Q: May I download the training videos? A. No. You may not download the training videos. The training course can only be accessed online but the course note pages, RCM Decision Diagram, and RCM Quick Reference Guide are downloadable. Q: Do I have to take the training all at once? A. No. You have lifetime access to the course. You can take the course all at once or you could choose to dedicate as little as 10 minutes per day. A. Yes. Everyone who completes the course receives a certificate of completion. Q: Am I allowed to share my access? A. No. Your registration allows one user to access the training. You may not share your access. If we determine that you have shared your access, we reserve the right to terminate your access without a refund. Q: Do you offer group registrations? A. Yes. Click here if you are interested in setting up access for your whole team or organization. A. We accept payment by PayPal or credit card payments from Visa, MasterCard, Discover and American Express. If you need to purchase the course using a purchase order, then click here to contact us. Q: Will I be able to implement RCM after completing this course? A. 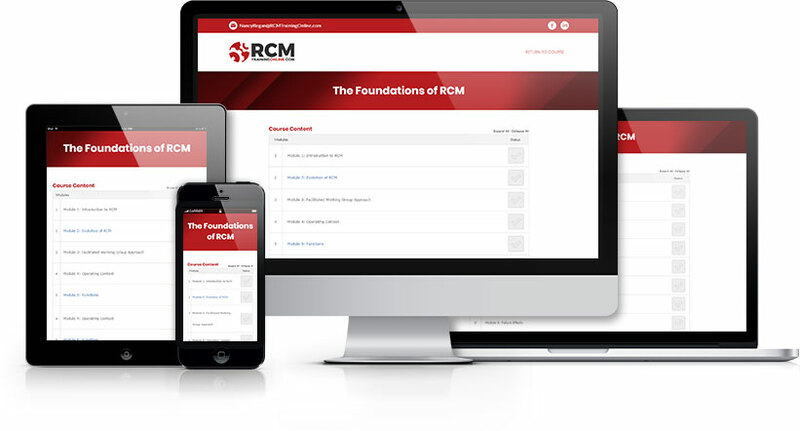 The Foundations of RCM online course will allow you to understand the basic principles of RCM. RCM is a particularly specialized process. Like any discipline, it takes additional training and experience to properly implement RCM.